We're losing our minds here. Remember when we saw all the people who were going to be in the Taylor Swift "Bad Blood" video shoot and everyone completely freaked? Now we officially have a whole new reason to freak out. Not only do we get a release date, we also get a snazzy poster for the music video. Where to begin? How about why can't this be a real movie poster? Out of all the things we already thought about Taylor, badass superhero wasn't quite one of them. But we'll take it. 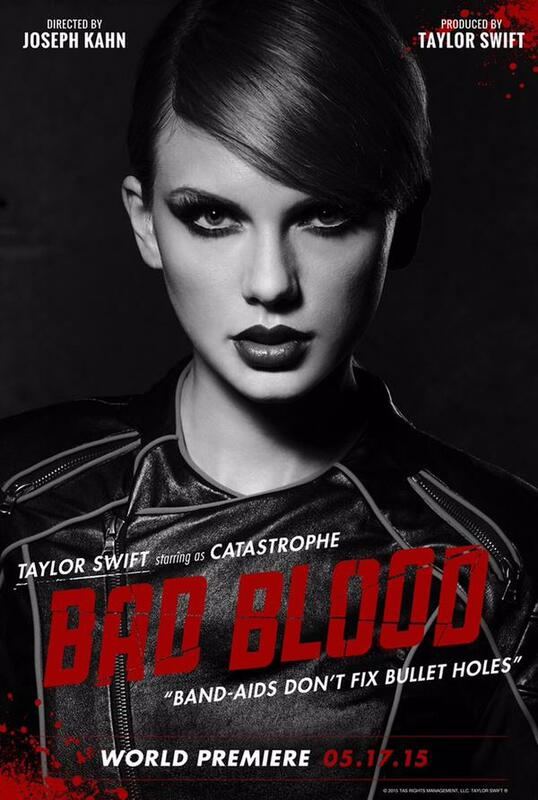 Taylor apparently plays a character called "Catastrophe" in the music video for her fourth single from 1989. "Bad Blood" gets a world premiere ahead of the Billboard music awards on the 17th of this month and it is set to star Taylor, Zendaya, Cara Delevingne, Hayley Williams, and even Kendrick freaking Lamar. What Are Cara Delevingne And Taylor Swift Working On?